The Dumoine River, September, 2018. First Annual Burt Reynolds Memorial River Run! We are 4 novice white water paddlers getting together for our first river run. A year and a half earlier we had taken tandem WW lessons together at MKC. For two of the guys this was to be their first real river trip. The third guy was on river number 3. I call myself a novice because I don’t think I’m very good. But, when the guys asked how many rivers I had run I did some mental gymnastics and discovered this was number 14. Huh? When did that happen. The Dumoine is a popular and well documented tributary of the Ottawa river. It has been a popular white water canoe destination for over 50 years. It doesn’t seem to be as busy with paddlers today as it has been in years past. I was surprised to find that there aren’t any trip reports on the MyCCR forum for the Dumoine. We ran it from 10 Mile Lake to the Ottawa river. It is roughly 100km. At the beginning of our trip we parked our cars at Dumoine Valley Guides in Rapides-Des-Joachims (Swisha). From there, we were shuttled to the outlet of 10 Mile Lake by van. At the end of the trip we got a boat shuttle from the bottom of Ryans Chute back to the Outfitters dock in Swisha (about 16km). Another popular alternative for a start/finish point is Pine Valley Resort on the Ottawa River. We didn’t do this so I can’t comment. However, Etienne at Dumoine Valley Guides was excellent to deal with and I wouldn’t hesitate to recommend them. 4 hours on roads like this. The shuttle takes bush roads to 10 Mile Lake and it is a doozy. It took 4 hours. In a couple of places I wasn’t sure we would get through. If you do this shuttle and get to a point where the road looks really bad, be aware it gets worse. When you get to that point, be aware it gets much worse! Of course, your experience may vary depending on how recently the bulldozer and back ho have gone through. They typically maintain the road once in the spring and once before hunting season starts. The shuttle driver dropped us off at a small access point on the Riviere du Nord which skips the first 3 portages of the trip. Our trip was 7 days. It could easily be done in 6 or even 5 days. We were in no hurry and wanted to stay on some specific lakes/campsites each night. When we ran it The Riviere Du Nord had three short rapids. The last was a bit tricky as it dog legged right and had some significant obstacles. We didn't see any portages around these rapids and they are all runnable. It took no time to get to lac Brulart. After quickly crossing the southern bay of lac Brulart we were officially on a short winding stretch of the Dumoine River that leads in to lac Laforge. We travelled 15k to our first night’s camp at Alligator Point. Alligator Point is a Tombolo on the west side of lac Laforge. The campsite is excellent with both north and south facing beaches. It gets its name from the remains of 2 Alligators that can be found by following the south beach to the west. These Alligators were logging boats used at the turn of the last century. They would tow log booms across lakes and could haul themselves overland. Definitely worth checking out. The next day was short distance wise (as were most days on this trip) but it was still tiring. The first two portages of the trip were around two thundering waterfalls. The trails are well used and not difficult to traverse although the first one has a awkward rocky put in. The portage around the 2nd falls ends in some beautiful rock ledges that are great for a lunch or swimming stop. You can just make out a carving in the rocks face. A logger’s name and the date 1887. It was at this portage that we saw the back of a solo paddler as he paddled down lac Manitou. This was the only canoe we saw on the whole trip. After the falls are a few swifts and C1 rapids that lead you to the very imposing Triple Play rapids. Triple Play is a series of three C3 to C5 drops connected by C1 and C2 rapids. You could portage all of them from the first take out to the end of the last falls which is something like 1 1/2km. Or you can just portage around the major drops. The second half of this trail is extremely rugged. There is no way we were carrying our white water boats up and down those goat paths. We opted to run or line up to the lip of each of the major drops before portaging. Be very careful if you do this. A couple of the take outs are very close to the lip. The consequences for slipping into the river or missing your mark could be tragic. After Triple Play comes Bridge Rapids. At this point there is an old Bailey Bridge crossing the river. The road comes from the west and then abruptly stops at the east side of the bridge. This is a popular start for shorter trips down the river. Bridge rapids is an easy but long C2 rapid. The start of the rapid just before the bridge has a good fast chute and the rapids on river left approaches C3. After you paddle under the bridge the river levels out and you have a great C2 and C1 ride for 1 1/2km into Lac Benoit. We camped that night on an island campsite dubbed Little Italy. Another great big flat site. It came complete with a recently installed colourfully painted thunder box. We saw a few more of these at campsites along the river. All the sites we stayed at were very clean and well taken care of. It is clear to me that some users of the Dumoine do a great job looking after the river. As was the trend for the trip we didn’t cover much ground on the next day. We ran lined or portaged 16 rapids. We avoided many of the major drops. Some of which I would like to run on a future trip. For our first time down the river we were perhaps overly cautious. Still, we ran a lot of C2 water. A couple of times the other canoe in our group got completely swamped in their Prospector. I paddle a Swift Dumoine. It was MUCH better at shedding waves than the Prospector. We may have had a bit less weight in our canoe and perhaps picked some dryer lines but the difference in how much water each canoe would take on was dramatic. I have a new-found respect for my canoe and no longer pine for the big wave shedding capability of a Esquif Canyon or Evergreen Starburst. We initially planned to spend the night at Little Steel Falls. But, the site didn’t have the greatest tent pads and we found the noise was a bit much so we carried on. We ended up camping at the site of an old logging camp on Burnt Island lake. Again, this was a great flat well maintained site with a new painted thunder box. You can also see the remains of an old log ramp used for rolling logs into the river. Next day was an easy one. We took our time going down the river. I don’t think we portaged once. Just did some lining at Big Steel Rapids. Most of the rapids were C1 and swifts. We fished a bit, only catching a couple of small bass. I was disappointed in the wildlife and fishing on the Dumoine. Unless it is a spring trip, I will leave my rod at home next time. The biggest animal we saw was a red squirrel and there were very few signs of anything else. The odd bit of wolf or moose poop. Hardly any tracks. We did get to see a few interesting sites along the river. Cabin remains, an old loggers grave, a beautiful waterfall. The river scenery was spectacular. The Dumoine is absolutely beautiful. Certainly worth a repeat visit. It was a beautiful sunny day and we stopped early to camp at the Margaret Spry Shelter. It was a good time to hang out all of our stuff to dry. In spite of having decent weather the dew was so thick every morning it sounded like a light rain was falling on the tent. As a result, each morning we packed up saturated tent flies and tarps. The Margaret Spry Shelter is a Lean-to erected by the Dumoine Road and Gun Club. The campsite around the shelter is well used and beaten down but still very clean. If you walk east from the shelter back up river a bit you will find a very large and much prettier campsite covered in red pine. While staying at the shelter campsite we took a walk up to the Rod and Gun Club. It was celebrating it’s 100th year in 2018. The buildings themselves are even older with some dating back to the 1840’s. We didn’t see anybody there. Called out a couple of times but nobody came out to greet us. So, we poked around a bit by ourselves. Pretty cool spot. Very well taken care of with lots of relics from bygone eras. Dumoine on the Dumoine with the Dumoine Club in the background! We started the next day by travelling for an hour in a thick mist. As it lightened through the morning the hills and trees were revealed to us in beautiful layers of gray and green. We ran a couple of C2 rapids before getting to Grand Chute. Grand Chute is a spectacular series of chutes, waterfalls and C4 and 5 rapids that run for a kilometre or so. There is a rough portage along the waters edge with lots of lookouts and a couple of campsites. A much easier portage runs along the road away from the river. Best to carry your gear down using the road and come back up along the river to gawk at the spectacular sights! We spent a couple of hours soaking it all in. After Grand Chute we ran Walrus Rapids into lac Robinson where we camped for the night on another great island site. Our last real day of the trip was between lac Robinson and our campsite at the 3 Sisters. We didn’t portage at all today but we did have to line and lift over a few drops. Red Pine Rapids was a long fun challenging rapid. The river was again beautiful and spectacular with cliffs rising 500 feet straight up from the water. Our last campsite of the trip at a gentle rapid called 3 Sisters was the smallest of the trip, but was still a beautiful spot. For our final leg we paddled 2km to Ryan’s Chute where Etienne from Dumoine Valley Guides picked us up with his pontoon boat and shuttled us 16km back to our cars. This was an awesome trip down a gorgeous river! A good time was had by all and we are already planning for the 2nd annual Burt Reynolds Memorial River Run. Super trip report and pictures! A classic WW river. Very nice report and pictures. Thanks for posting. Last edited by steve.of.london on October 22nd, 2018, 7:29 pm, edited 1 time in total. Thanks Swampwalker, Ralph and Steve! @steve.of.london I appreciate the sentiment. I actually enjoy making this stuff and use CCR as sort of a repository of my trip reports. Over the years MyCCR has been solid while other sites and forums have come and gone. Hopefully some people enjoy them today. Hopefully, in the future, some people will find them and get inspired to take similar trips. Terrific report and video! This puts the Dumoine on my list. Thanks for all the attention to detail! Thanks for posting. Never heard of this river before so really pleased to be made aware. We are doing the trip in June 2019 so your report will be handy. One question, did you rent canoes there? Wonderful trip report. Thanks for posting. Happy to see you paddled a namesake craft for the river trip. We were shuttled by Dumoine Valley Guides. They were great! But they dont rent canoes. I believe you can rent canoes from the first nation band in Swisha. http://www.algonquincanoe.com/ Call ahead to make sure it is operating when you go. I think they are only open in the summers. Noel LeClerc is another option. He has been renting canoes and running shuttles out of Swisha for decades. Thanks for posting this report . I really enjoyed it . 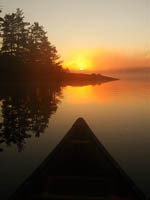 I ran the Dumoine in the 1st week in May from the Kipawa River near Hunters point to Stonecliff on the Ottawa River . The river was in flood and every portage had snow and ice to wade through . Very challenging trip but we still remember it fondly . Thanks Joe! That sounds like an awesome trip. I'd love to do the Kipawa and Dumoine together. Although, I think the Dumoine would be too intimidating for me in May.